The fully automatic Microtome A550 provides utmost reliability, user benefit and outstanding operator comfort. The high section stability and precision turn this instrument into an universal multipurpose microtome for highest demands on sectioning paraffin as well as for hard sectioning technique in biology, medicine and industry. 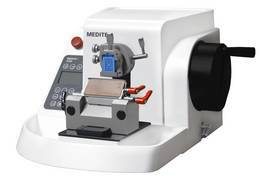 The cutting motor drive allows precise sectioning, ensuring good reproducibility. Another user-friendly feature is the cutting window that can be adjusted to the specimen size, while the preselected speed is only applied within the cutting window. This enables the user to section delicate specimens precisely in a short period of time. The large section thickness range from 0.25 µm to 500 µm is divided into fine sectioning and trim sectioning. You can easily switch between these two ranges, even while sectioning. Memory positioning allows the fast movement to a stored cutting position by pushing one button only.